1. Soak the basmati rice for 30 mins. Then pressure cook the rice with 1.5 cups of water for 2 whistles. After the pressure releases, fluff the rice with a fork and spread it on a plate to cool. Meanwhile, chop the veggies and onion. 2. Take a wide pan and heat the oil. Then add the red chilli flakes and the chopped garlic. When the garlic turns golden brown, add the chopped onion. Saute it until the onion is translucent. Then add the chopped veggies (mushroom, carrot and peas) and cook it in high flame until it is soft. Add required salt. 3. When the veggies are cooked, add the soya sauce in high flame. Finally, add the cooled rice and mix it all together in high flame. Add the pepper powder and adjust the salt. 4. 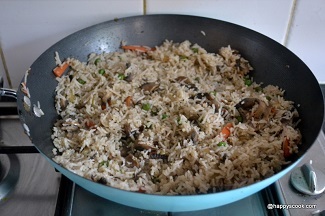 The yummy and healthy mushroom fried rice is ready. I served it with onion raita and chicken chippies. You can replace, red chilli flakes with spicy red or green chilli sauce. If you don't have red chilli flakes, you can grind the whole red chilli coarsely. You also add green chilli if required for spiciness. Instead of pressure cooking the rice, you can cook it in open pot with 5 to 6 cups of water. Finally, drain the rice and spread to cool. Basmati rice can be replaced with normal rice or leftover rice too. You can also add vegetables like capsicum, beans, cabbage or corn too. But don't add too many veggies since it reduces the mushroom flavour in the rice.